LOCATION: Upper town, set on a cliff less than 800 metres from Main Street town and under 1.8km from Central Beach/BI Hotel. 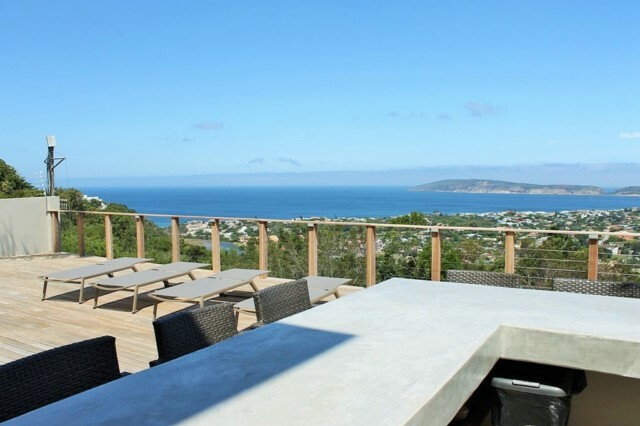 VIEW: Ocean, the pristine white Robberg Beach and Robberg Nature Reserve, and the green expanse of Plett Country Club. Stylish, up market multi-level modern designer house offering absolute comfort, elegance and style with spectacular views. Top quality fittings & furnishings all in crisp white with earth coloured tones. Fenced-in with electric fencing offering security. Top level offers spacious open plan living with 2 dining areas, TV lounge, kitchen and informal lounge with built-in braai all enjoying the stunning view and opening onto balcony (enclosed with hip-height glass balustrading) with lounge area. En suite bedroom and guest toilet. Lower level is fitted with kitchenette and Bedrooms 2 & 3, with family bathroom. Bedroom 4 is off downstairs patio. A level down is the netted pool with outside braai and bar/entertainment area and well maintained garden from where you can enjoy incredible views. BEDROOM 1 (U/S): Queen en suite (bath/shower/toilet), with views & opening onto balcony. BEDROOM 2 (D/S): 2 singles, opening onto balcony with views and overlooking pool & entertainment area. Sharing bathroom (bath/shower/toilet). BEDROOM 3 (D/S): Queen en suite (shower/toilet), opening onto balcony with views and overlooking pool & entertainment area. BEDROOM 4 (Off lower patio): Queen en suite (bath/shower/toilet), with views. - Swimming pool with net & sun loungers on deck with views. - Mandatory housekeeper included in rental contracted to work for occupants 5 days a week [Mon-Fri, excluding public holidays] from 8am to 5pm. Weekends & Public Holidays are on request directly with housekeeper & payable to her direct. - Pets allowed on request only. - Air con in top level.